Simply elegant, perfectly rustic. A uniquely textured background lends a worn look to these seal and send wedding invitations while an antique-inspired flourish frame wraps your last name initial in sheer beauty. Your wording is printed in your choice of colors and fonts. Seal and send wedding invitations include a perforated card at the bottom printed with your response wording on one side and your address on the other. Your return address is printed on the outer flap. Price includes clear round seals for securing the invitations. Other seals may be purchased separately. Very fast delivery. Beautiful. Easy to edit template. Would recommend. Thank you! 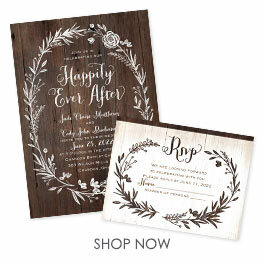 This invitations is perfect for our simple rustic vintage wedding. I can't wait to add my final personal touches and send them out! The invitation were very nice and they arrived very quickly. I did upgrade to be thicker card stock paper. I thought this paper was a bit too thick. Next time I will probably go with the regular paper. The seals it came with were very easy to use. We purchased these invitations for our Wedding. It was easy to personalize on the site, we ordered samples first and decided we liked these ones the best. We got them shipped so quickly! They sent us 5 extras, thank goodness in case we made a mistake since we hand wrote our addresses. And they look amazing! Better than I expected. It's great that it's an all in- one- invitation. Post card stamps are cheaper than regular ones so we saved money there and you can't beat the prices of these elegant invitations. We were very happy with the outcome and would recommend it to anyone. These all-in-one invitations turned out so beautifully! They are simple, elegant, and excellent quality. These shipped extremely fast! I was very pleased with how quickly they arrived, especially since I was short on time! Wedding invitations were received fast and were of better quality than even expected. They were beautiful! The Seal and Send covered everything without needing additional inserts or envelopes and couldn't be more convenient. They were functional without taking away the elegance and I've received several compliments. The tear-off RSVP card can be returned with a 34 cent postcard stamp and a single Forever stamp covers postage for the entire envelope, even with my upgrade of paper weight. The cost of this site was excellent compared to the (what seemed like) hundreds of others I looked at. Designing the cards online was also easy and provided more options than several other sites, such as changing the color of the text. Invites were shipped within 2 days and delivered timely. Most sites say 4-6 weeks until shipped. They were so fast and convenient. I browsed several sites looking for invitations for my daughter's upcoming wedding and always came back to this one. The quality is outstanding. My daughter and I both love the simple elegance of them and the fact that the RSVP card is attached. My other daughter is getting married in May 2015 and I will most definitely be ordering her wedding invitations from here also. I can't speak highly enough of this company. Will recommend them to everyone I know. I wanted something simple but elegant for my wedding invitations. They looked vintage and included a "reception card" and an RSVP card. All of the information fit perfectly on the invitation. However, I am including an extra information card inside the invitation and to prevent them from falling out, I bought envelopes to mail the invitations in. This also prevented the invitation itself from getting damaged in the mail. Other than that, I'm very happy with my purchase!